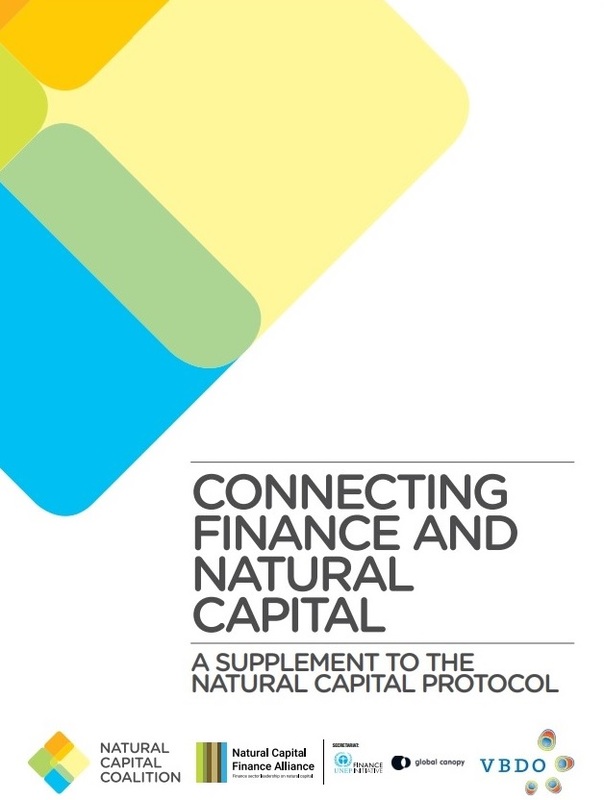 Editor’s note: The Natural Capital Coalition, Natural Capital Finance Alliance (NCFA) and the Dutch Association of Investors for Sustainable Development (VBDO) have just released ‘Connecting Finance and Natural Capital: A Supplement to the Natural Capital Protocol’. This supplement provides a framework for financial institutions (FIs) to assess the natural capital impacts and dependencies of their investments and portfolios. Find out below why the financial community, from banking and investment to insurance should get on board plus how the supplement can help this transition. Last year, the Financial Times reported that “the outperformance of ESG strategies is beyond doubt”, and that while this trend is particularly marked in emerging markets, equally impressive results have been recorded globally. They found that numerous indices developed by the leading index provider FTSE Russell, found that companies with policies on ESG often reap returns well above the benchmark FTSE Global All Cap Index, and that investors are taking notice. Since 2009 they’ve pumped over USD5.7 billion into BlackRock’s ESG index-tracking funds. Investors are not only realising that these strategies make common financial sense, but they are also waking up to the power that they hold to drive market-wide adoption of these standards, and they are beginning to exercise this new-found power en masse. The push from investors has empowered business leaders and CEOs to take further action on environmental, social and governance issues. The argument often levelled at ESG advocates, that action cannot be taken because ‘we are beholden to our shareholders’, has now been fundamentally turned on its head. When, during their 2014 AGM (Annual General Meeting), Apple’s CEO Tim Cook was asked to commit on the spot to only taking decisions that would deliver an immediate financial return for the company, he replied that when developing products for the disabled, or when taking a position on environmental issues and worker safety: “…I don’t consider the bloody ROI (return on investment)… If you want me to do things only for ROI reasons, you should get out of this stock”. This kind of statement would have been completely unthinkable even a few years earlier. It highlights the fundamental shift that has occurred in the business and financial landscapes in the years since climate change, environmental degradation, and all of the intractable challenges that come with them, have erupted into the public consciousness. Investors are not the only members of the financial community to recognise the business case for taking concrete action around these issues. In 2016, insured losses due to natural disasters in the United States totalled USD23.8 billion according to Munich Re, up 7.7 billion on the previous year. In 2017, we wrote in the Huffington Post that this should be a wakeup call for insurers, reinsurers and the financial sector more widely. In 2017, NOAA (National Oceanic and Atmospheric Administration) estimates put this figure at USD306 billion, a 1185% annual increase which “shattered” the previous U.S. annual record cost of USD219.2 billion (CPI-adjusted) which was recorded in 2005, the year of Hurricane Katrina. Insurers have experienced predictably significant hits. The insurance and reinsurance underwriting division at Warren Buffett’s Berkshire Hathaway for instance, recorded a loss of USD3 billion due to Hurricanes Harvey, Irma and Maria alone. With more frequent instances of extreme weather predicted by meteorology agencies around the world, and leading executives warning of the risk of uninsurable properties throughout global cities, insurers are beginning to take action. Some are exploring new revenue streams, for instance by developing innovative new policies such as the “Coastal Zone Management Trust” which, according to Swiss Re, will finance “what will become the first-ever parametric insurance policy covering a coral reef and the beach sand against the impact of hurricanes”. 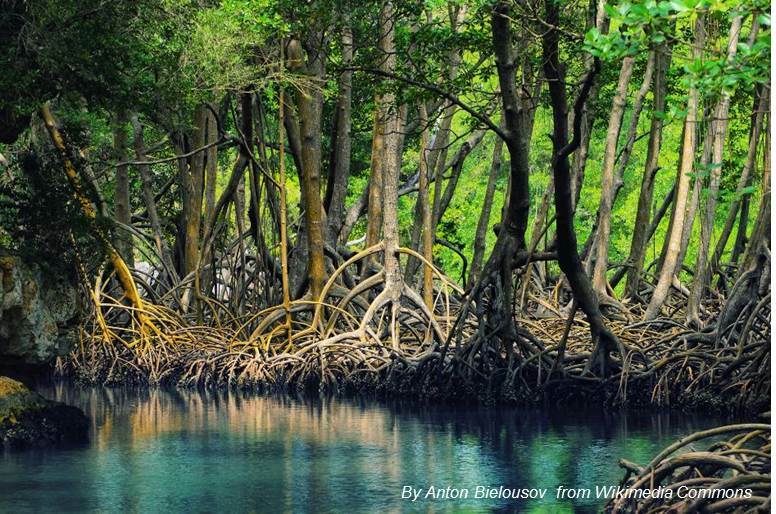 Others are looking to directly harness the power of natural capital itself, through the application of concepts such as ‘nature- based solutions’. Lloyds of London for example, the oldest insurance marketplace and regulator in the world (founded in 1686) released a report in 2017 demonstrating that natural coastal habitats such as mangroves, coral reefs and salt marshes protect communities more effectively against coastal storms than seawalls and other grey infrastructure, and that insurers should consider the health of intact coastal habitats when pricing flood risk. Insurers have huge power to influence customer practices. Everyday consumers are expected to meet certain minimum standards in order to obtain policies. For instance, you can’t take out a fire damage policy without fitting smoke alarms, and if you want to insure the contents of your home, you’ll need to install double locks as a reasonable precaution. If insurers begin to see extreme weather issues in similar terms and put common sense minimum standards in place to incentivise the use of innovative practices such as nature-based solutions, this would be a win-win for insurers and the environment, and ultimately a win for consumers and wider society too. In the wake of these shifts in perception and understanding, many in the industry are beginning to realise what a few have been saying for years; the perceived dichotomy between ‘doing good’ and generating business value — and ultimately profits — is, in many cases, false. There are a variety of initiatives and methodologies that have been developed in order to enable financial institutions to better understand the natural capital risks and opportunities associated with their direct operations, and their investment, lending and insurance portfolios. 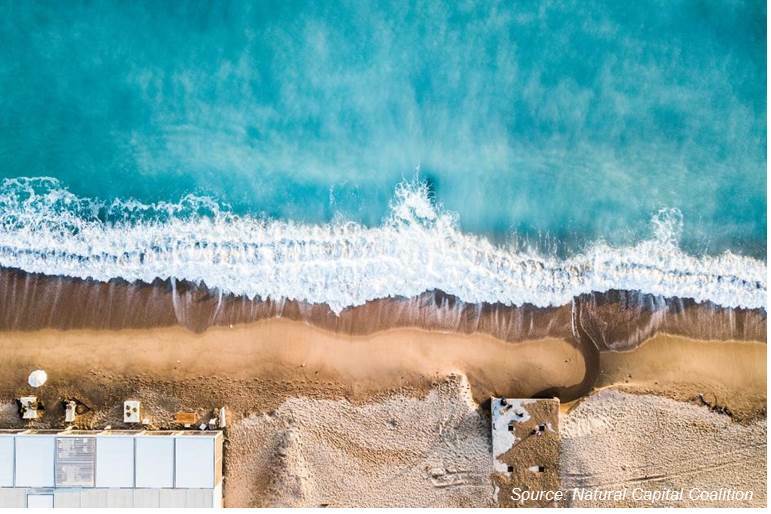 However, there has been no agreed framework that provides financial institutions with a clear introduction to natural capital issues, or a standardised process to measure and value their impacts and dependencies on natural capital. On April 23, 2018, ‘Connecting Finance and Natural Capital: A Supplement to the Natural Capital Protocol‘ was launched by Natural Capital Coalition alongside the Natural Capital Finance Alliance (NCFA) and the Dutch Association of Investors for Sustainable Development (VBDO) in Hong Kong, hosted by the Hong Kong Institute of Public Chartered Accountants (HKICPA). The Supplement provides guidance to help FIs incorporate natural capital impact and dependency considerations into their lending, investment and insurance practices. The Supplement was developed against the backdrop of growing acknowledgement that the natural systems that underpin the global economy are deteriorating past the point of effective service provision, and that this will have potentially significant consequences for many businesses, and subsequently, for those who have financed or insured them. 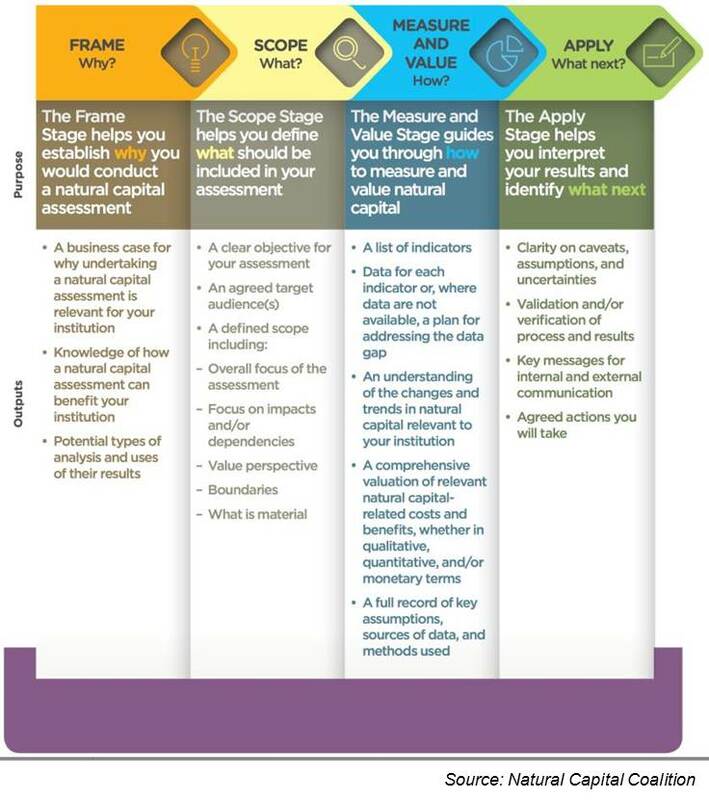 The framework is a companion to the Natural Capital Protocol; a standardised decision-making framework that allows businesses to identify, measure and value their direct and indirect impacts and dependencies on natural capital. In 2017, the EU High-Level Expert Group (HLEG) on Sustainable Finance delivered their much anticipated recommendations for a comprehensive EU roadmap for green finance to the European Commission in Brussels. More encouraging still is the recommendation that the Commission should support the use of this Finance Sector Supplement to the Natural Capital Protocol (among other frameworks) as a means for financial institutions to ‘quantify, report and manage natural capital risks and opportunities in their decision making’. In 2014–16, the two years following Tim Cook’s comments at Apple’s AGM, “ESG integration” — the value of funds allocated to ESG investments — was estimated to have jumped by 38 per cent to USD10.4tn. What investor would turn their nose up at that kind of market growth? Joseph Harris-Confino is the Natural Capital Coalition’s Head of Communications, and leads on the Coalition’s outreach and advocacy. Previously, Joseph has worked for Sürdürülebilirlik Akademisi in Turkey, The B Team and Futerra in New York, and Guardian Sustainable Business & Salterbaxter MSLGROUP in London. Joseph has also spent time with AMREF in Uganda studying integrated development projects in the Ugandan village of Katine, and with Fundación Gaia Amazonas in the Colombian Amazon Basin, whose main aim is to gain legal rights for the indigenous communities in the area and protect the forest from illegal logging and mining. 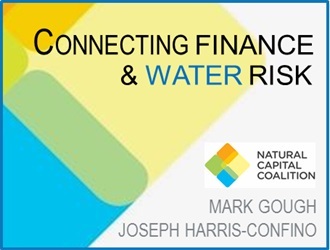 Mark Gough is the Executive Director of the Natural Capital Coalition, and led the collaboration that delivered the Natural Capital Protocol, a standardized global framework for including natural capital in decision making. Mark previously worked for The Crown Estate, helping to develop its integrated vision and approach to value measurement. Prior to this he was the Global Environmental Manager for the information company, Reed Elsevier. Mark is a Director of the Aldersgate Group, which brings together business, politics and civil society to drive action for a sustainable economy, and a member of the TEEB Advisory board. He has sat on a number of national and international committees, including the Steering Committee of the United Nations CEO Water Mandate and the Board of the Alliance for Water Stewardship.